ATV Parts Guide. 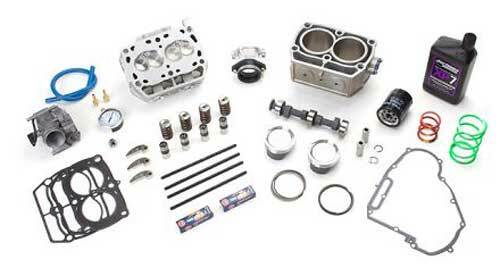 Find Great Deals on Four Wheeler Parts. When you need ATV parts and who doesn't? - check out these pages to get you pointed in the right direction. We look hard for the best sources and the best deals for new and used 4 wheeler parts. Then we tell you about them because that's our job. If you prefer OEM parts, we'll tell you where to find the easiest to use parts finders to make sure you get the right parts numbers and the best prices. This is a big category so check back often because we'll be adding new pages regularly. If you have a favorite quad parts source, tell us about it so we can share it with everyone else. Happy hunting! New Parts and Accessories - Learn about the latest announcements of new parts and accessories. ATV Junkyard Guide - If you want to keep your four wheeler running but don't have the budget for new parts, we have good news for you. Learn the ins and outs of getting the right used parts for your ATV. Cheap ATV Parts - Parts for the best value aren't always the cheapest price. Don't miss this article about how to tell the difference. Full of tips about where to find the best sources of high value parts. Arctic Cat Parts - Our custom links will take you directly to the best deals. Better yet, they automatically update so they always show the best bargains available. Arctic Cat Oil Change Kit - We tell you the difference between OEM kits and aftermarket filters. Find out why one may be clearly better than another. Links to the best values. Arctic Cat ATV CV Joints- Buyer's Guide to cv joints, kits, and axles. Includes links to the best deals online. Honda ATV OEM Parts - How to find OEM Honda parts for less money than most dealers would charge. Learn how to look up parts yourself online. Includes links and complete instructions. Honda ATV Battery - When it's time to replace your ATV battery there are a few things you'll need to know. Find out what they are and where to get the best deals on ATV batteries. Honda Four Wheeler Parts - Tips on how to save money on Honda parts for ATVs. Learn how to use online auctions to find the parts you need at bargain prices. Parts/Accessories Guide for Honda ATVs. - Where and how to find the best deals on Honda ATV accessories and parts. Direct links to the best online deals and shopping tips to find what you need without wasting time. John Deere Gator Parts - Save money with these tips on where to find bargains on Gator parts and accessories. Includes direct links to value prices on the most popular items for your Gator. Polaris ATV Repair Manuals - Repair manuals are a necessity for almost any kind of maintenance or repair job. Here's how to find the best ones at the best prices. Polaris ATV OEM Parts - How to find the best deals on OEM Polaris parts. Polaris Replacement Parts - Find great deals on thousands of Polaris replacement ATV parts. Custom links save time and make it easy. Polaris ATV Performance Parts - Guide to Polaris performance parts. What works and where you can find the best deals. Polaris ATV Used Parts - Over 7,500 Polaris parts listed every single day! Use our custom links to find what you need. Polaris 4 Wheeler Parts - Feel like your local dealer is holding you hostage? We offer some alternatives for buying replacement parts for your Polaris ATV. Tips and links to help you save those hard earned dollars. Suzuki Parts Warehouse for ATVs - Tips on how to find great parts deals in a "virtual" parts warehouse with over 90,000 parts listed. Suzuki ATV Wheels - Buying tips for the most popular ATV accessory. How to find the largest selection and best prices. Special links to guide you directly to the best deals. Yamaha ATV Battery - Buyer's guide with everything you need to know about ATV batteries and where the deals are.